Hello Everyone! I don’t know what I am thinking because June is a busy month but I am always up for a challenge. From June 1 – 30th is the 30-day coloring challenge created and hosted by none other than Kathy Racoosin at The Daily Marker. 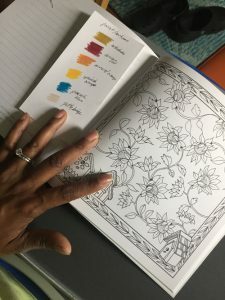 What I decided to do this time around is write a post three days in so that I have time to color, photograph and write a post before pushing it live. I also think I will limit this challenge only to colored pencils since I have some really amazing new coloring books that I absolutely have to color. This is from Day 1 which was on Saturday. I convinced my youngest, to help me kick off the challenge by coloring with me. He is coloring in one of my old coloring books that contain a bunch of mandalas. I helped him select a color scheme and he dove in. 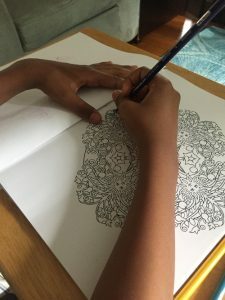 I think I will try to get him to color with me on another day too because although he didn’t want to admit it, he was having fun coloring and chatting with me. I chose the “In My Garden” coloring book. I am always discovering more about myself each time I sit to create. What I noticed was I gravitated to this smaller book to kick off the challenge. There is something comforting about a smaller canvas. It’s not too small it’s more of mid-range size about 8×8. So it’s fun to hold and easy to turn while coloring. I used one of my pre-made color swatches that I created a few weeks back to help me with my color selection. I find them so handy and when I use them the pages always look more cohesive. I will be back tomorrow with day two. Previous PostHappy Monday!! It’s that time of year – plant shopping! !